Uwe Hunemeier has hailed his Brighton & Hove Albion team-mate Lewis Dunk as the best defender in the Championship. 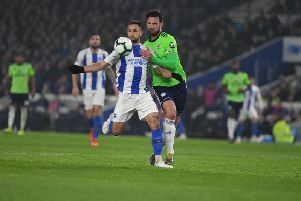 German defender Hunemeier has played three successive games alongside Dunk, since Shane Duffy broke a metatarsal in the 3-0 defeat at Nottingham Forest earlier this month. Albion kept clean sheets against Rotherham (2-0) and Derby County (3-0), before losing 2-0 against Leeds United. Dunk was named in the Championship team of the season this week alongside Anthony Knockaert, David Stockdale and Glenn Murray. Hunemeier, who joined Albion from Paderborn in August, 2015, said: “If I look back to last season, I haven’t played a lot with Lewis, probably just four or five matches but he’s a good player. Hunemeier has had to be patient this season, owing to the form of Duffy and Dunk, but said: “We’ve got such a big squad and in every position we’ve got four players who fight for that place. Everyone wants to play, but you have to train hard, work hard and wait for your chance. “That’s what I’ve done all season and I’m happy things have worked out so good. I’ve played the last two games and they worked out really well.